The darkness, the beauty, the necessity and the uncertainty of the winter season make surprises and challenges for us all. Like the observer on the train who passes a train moving in the opposite direction, for a moment it is impossible to discern movement either forward or backwards. As we approach the Christmas season, we weigh our options: shopping sooner or later, what gifts for whom and what to do to best celebrate the closing of the year. What an incredible movement forward as we focus our sights on the train rushing towards us, welcoming the New Year in which we emerge not as the person we have been, but as the person we have become, having passed through the crucible of Christmas event: giving, receiving and becoming all at once. And now, what can we do to celebrate these events? We can turn again with pot and wooden spoon to the kitchen, to the hearth, to the foundation of the family, to the beginning of all good things. Suitable for such an enterprise is a recipe from a rare find in a cookbook from Boretski Gallery in downtown Belleville. New Orleans Creole Recipes by Mary Moore Bremer (Waveland, Miss., 1932). We remember Mary Bremer with warm regards and hope that our efforts would be appreciated by her. As a chef, I have always loved the south and particularly New Orleans, which I first visited in 1963 when I was 12 years old. I had first considered sharing with you a shrimp gumbo recipe, but when I opened the cookbook to write this article, Gumbo Z’Herbs jumped out a me. My fondest clients, who came to my restaurant daily, loved my shrimp gumbo. So, they enthusiastically ordered this young chef’s early attempt at a simpler version of Gumbo Z’Herbs. I will never forget their faces, which had fallen to the floor in disappointment. Unfamiliar with eating vegetable tops which they usually discarded, they gloomily ate their lunch. 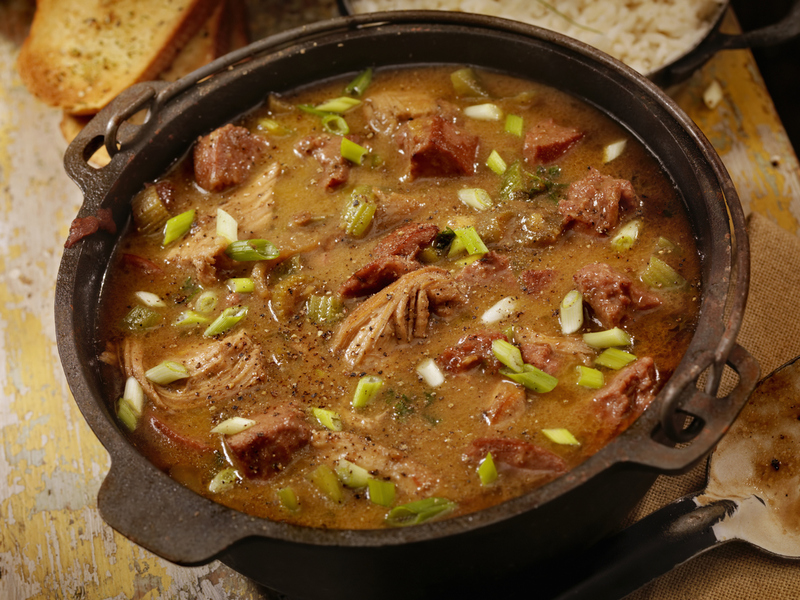 Now, happily I can suggest to them to consider trying THIS recipe for Gumbo Z’Herbs because this cookbook by far surpasses my simple efforts decades ago. Ingredients: One tablespoon lard, two of flour; one bunch each of spinach, mustard greens, green cabbage, beet tops, roquette, watercress, radishes; chopped onion, parsley, thyme, bay leaf, green onion top, salt, pepper, red pepper pod, or drop of tabasco. Bacon strip, veal or pork brisket, or ham bone. As many kinds as possible. You can do without any one or two. Wash well the greens, put in hot water and boil well. Drain off the water and save it. Fry the meat in one tablespoon of lard, chopping up the while, the greens with the onions and seasoning. Take out the meat and fry the greens, stirring solicitously, for they would rather burn than not. When they are well fried, add 1 tablespoon of flour, take a breath, and stir some more. Season well. Now add the meat and the treasured water of the boiled greens. Leave all to simmer an hour or so. One last rite, and you will have earned the joy you will have in your creation. Stir in one tablespoon of flour, dissolved in cold water. It has the magic effect of making the greens melt in your mouth like cream. So, when the two trains are passing in accordance with Einstein’s predictions, think of Mary’s Creole friends and our ancestors in hearth and home who endured challenges that are different than ours, but yet within our understanding. As they continue to speak to us, we speak for them and pass down the gifts of the past in thought, word and deed.